Quantum 5 Mega Firm Exothermic Perm is a patent-pending formula that delivers unsurpassed results on 5 key benefits: Enhanced curl definition, More shine, Incredible conditioning, Improved color retention, and New Aroma-Fresh odor block. 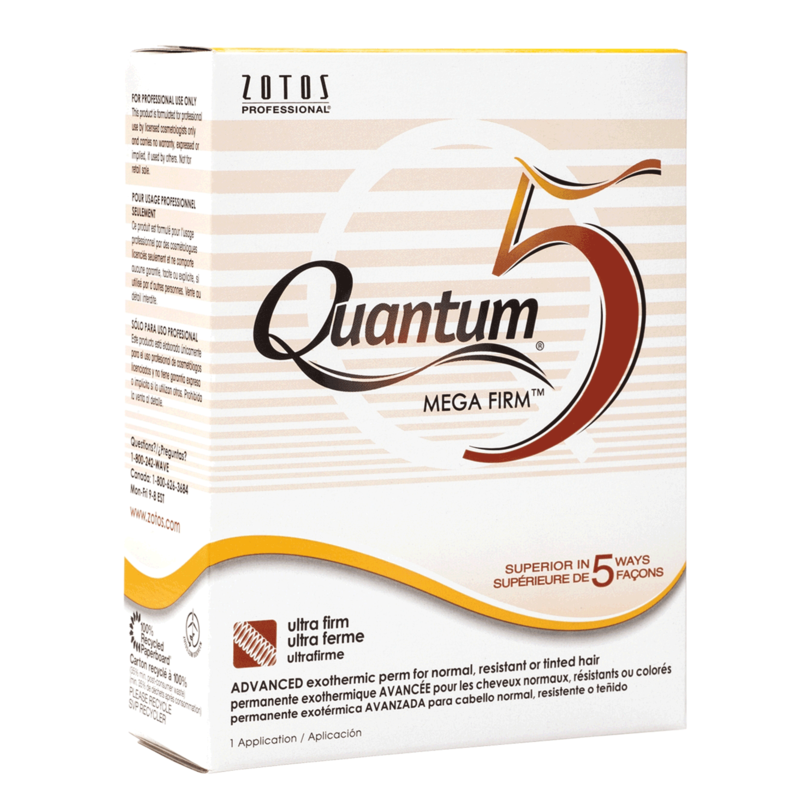 Quantum 5 Mega Firm Exothermicl eaves hair with a fresh, clean scent both during and after processing. No test curl. No dryer heat required. Ideal for normal to resistant gray and tinted hair. Shampoo: Gently shampoo hair with a clarifying or chelating shampoo and towel dry. Wrap: Choose wrapping technique: water wrap for a softer look, lotion wrap for firm texture, and combination wrap for varying curl patterns and special effects. Block damp hair into sections. Wrap smoothly with minimal tension. a. Water Wrap – If hair dries, lightly mist with water. Lotion Wrap – Apply Waving Lotion to one section at a time. If hair becomes dry while wrapping, lightly moisten with Waving Lotion. Combination Wrap – Section off are to be lotion wrapped and secure. Step 1: wrap complete water wrap section, following directions above. Step 2: wrap complete lotion wrap section, following directions above. Apply Waving Lotion: Place cotton around hairline and towel at the nape of neck. Puncture tip of Waving Lotion with T-pin. Apply lotion, saturating each rod thoroughly and evenly. Place plastic cap over all rods and secure. Process at room temperature. Do not process under dryer or heat source. - Apply interim treatment to each rod and cover thoroughly and completely. - Process for 5 minutes at room temperature (without cap) and blot dry. - Follow with the neutralizer step as outlined in the directions. - Style hair with a diffuser to achieve maximum results. - Quantum represents the very best in perming, straightening and haircare technology.